Sign up to our newsletter to receive the latest Vermintide news, exclusive content and invites to betas. 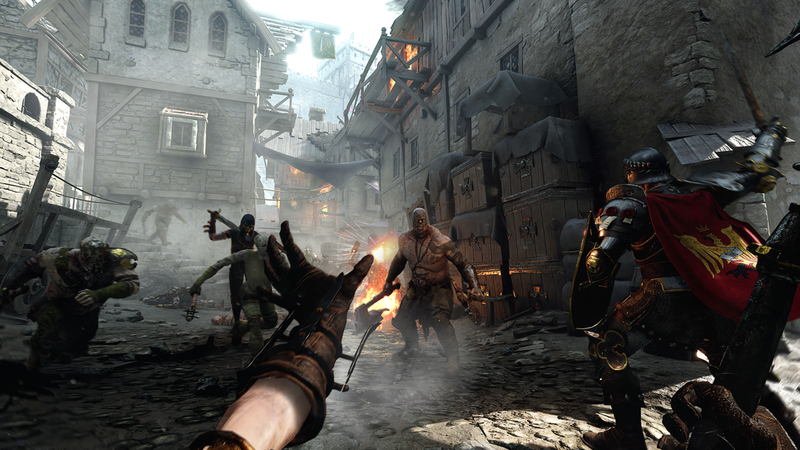 Warhammer: Vermintide 2 is packed with features that will immerse you deeply in the post-apocalyptic events of the Warhammer Fantasy Battles universe. Upon the heroes discovering an Ubersreik Lodestone, Olesya - the resident spy-master and grey wizard - sends the heroes into an illusion of Ubersreik. As the heroes return everything appears to be … sort of the same. In the second DLC for Vermintide 2, the heroes return to Ubersreik to uncover the dark truth hidden within the city. The first expansion for Warhammer: Vermintide 2 brings a brand new enemy faction and new challenges to the game. As a meteor crashes down in the Reikland, the Beastmen emerge from the depths of the Reikwald forest and rush to the epicenter to claim it as a Herdstone. It is up to the 5 heroes to stop them before a dreadful disaster strikes the Empire. The five Heroes of Ubersreik are back for more blood-splattering battles against overwhelming odds. The 15 unique careers provide different playstyles and add variety and depth to character progression. Each career has an individual talent tree, active and passive abilities, and access to unique weapons and equipment. Arriving in the Skaven infested ruins of Ubersreik all alone, and with no misfit band of Skaven-slayers allowing him to vent his rage, Kruber would have had to face the devastating loss of his family all by himself. At first, he was wary and distant towards the others, but along the way, Kruber did warm up to his fellow fighters and schools of thought. Play as Foot Knight, Huntsman, or Mercenary. Like all wood elves, Kerillian feels the pull of both light and dark. First, as a Waywatcher, and now as a more experienced Waystalker, she has kept those aspects in balance. Indeed, Kerillian’s reason for journeying to Ubersreik was an attempt to help her reclaim her moral poise. Play as Shade, Waystalker, or Handmaiden. Never the easiest of comrades, Victor Saltzpyre has shown little sign of mellowing since the early days of the Ubersreik invasion. Though it is hardly in his nature to trust such outcasts as are his companions in these dark days, he accepts that righteous work can sometimes be accomplished by stained souls and soiled hands. Play as Bounty Hunter, Witch Hunter Captain, or Zealot. Bardin is an unstoppable avalanche on the battlefield, an ale-swigging hurricane at the inn, and a steadfast friend by the campfire. Driven by his search for the lost dwarfen hold of Karak Zorn, Bardin has been somewhat side-tracked by the ceaseless Skaven interference. Yet he stays true to his spirit, fighting the good fight as a hero whose deeds do his ancestors proud! Play as Ranger Veteran, Ironbreaker, or Slayer. Sienna Fuegonasus is an addict, forever torn between her will to control the destructive magics of Aqshy – the Wind of Fire – and a burgeoning desire to set the world alight for no other reason than the rush of magic in her bones. Play as Battle Wizard, Pyromancer, or Unchained. Level up your heroes to unlock new talents, abilities and access to powerful gear. Each Hero has three careers to choose from. All careers include a unique talent tree, allowing you to spec your Hero to best suit your playstyle. The Heroes are bolstered with one active and passive ability, each unique for every career. Abilities can be crucial in turning the tide of a battle, so learn to use them effectively to increase the killing capacity and survival chance of your team.